I love Bangkok, but when the fast-paced city life starts to get to me, I make my way to Soi Rambuttri for a much-needed break. Believe it or not, sometimes Bangkok can be a little bit too fast paced. So every so often I pay a visit to Soi Rambuttri in the old district of Bangkok. Soi Rambuttri, like Khao San Road, is a haven for backpackers and budget travelers seeking a place to lay their heads in homely guesthouses for a little while before they move on. It's a place where life slows down in a city that is moving forward too fast. 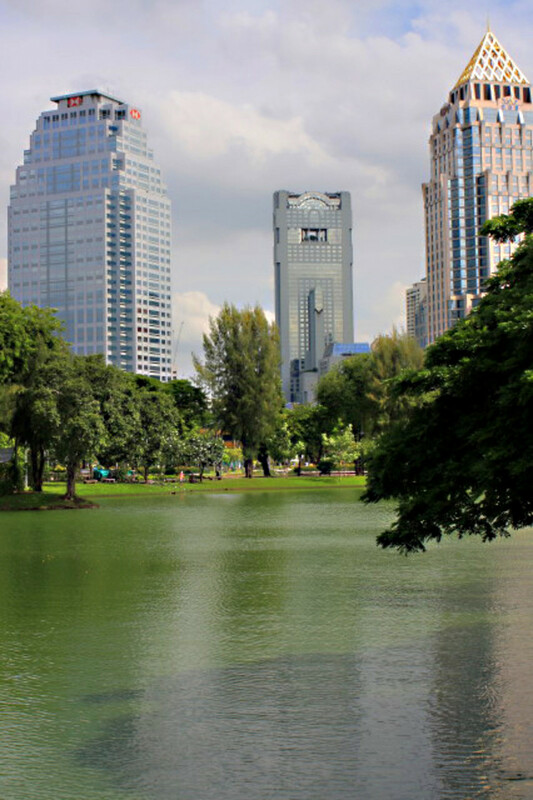 Bangkok is an ever growing city feeding on concrete; it has reached the peak of cosmopolitan status and has the potential to rival most modern Asian cities. Amongst the grit of congested traffic and crowds of shoulder to shoulder pedestrians lies a tiny slice of heaven just north of the hustle and bustle of Bangkok. It is called Soi Rambuttri, and it is nestled in the arms of a district named Banglumphu, or more commonly and rightfully referred to as the old district. Most have never heard of Soi Rambuttri. 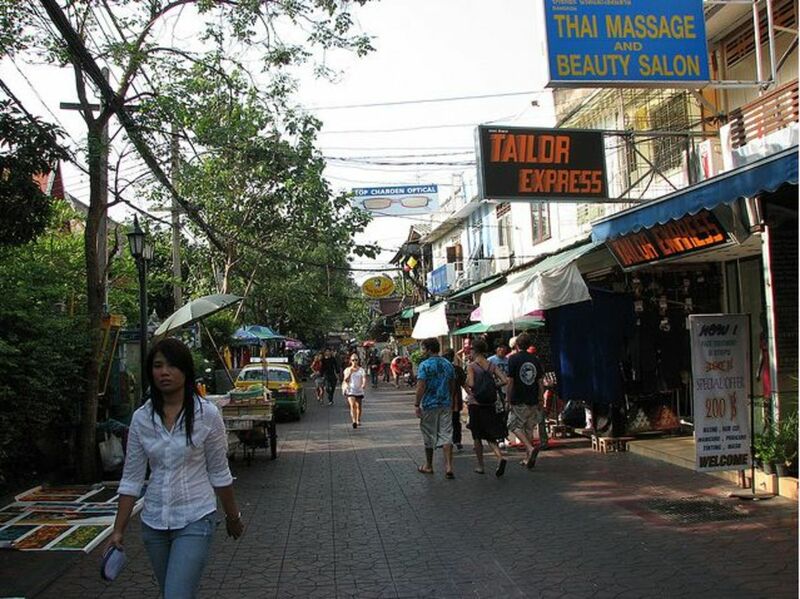 Though most will surely have heard of Khao San Road, a narrow street that is the mecca for budget travelers and adventurous backpackers. Khao San road has been immortalized in television, movies, and books as the place to be for the young crowd bearing rucksacks and backpacks. Its humble beginnings started during a government tourism promotion during the early 1980s. As a result, throngs of post-hippie visitors flooded Bangkok looking for cheap hotels or any place that would let them rest up a night for cheap. To meet the demand for cheap guesthouses, a band of entrepreneurial Thais opened up their spare rooms for rent. With all the new money flowing in along with the surge of tourist willing to spend, all types of businesses such as bars, gift shops, and restaurants appeared overnight, reaping in the Baht. Today the scene in Khao San Road has changed drastically. 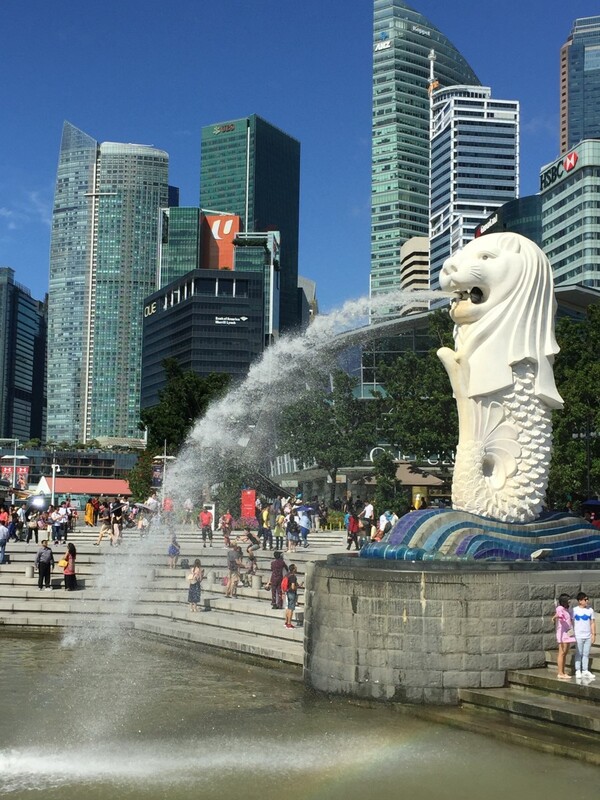 More upmarket hotels, bars, and restaurants have opened to cater to tourists who can afford to spend more while staying in the charming old city in modern air-conditioned private rooms. As a result, many smaller guesthouses and budget hotels can be found in Soi Rambuttri with hotel room rates under 1000 Baht. And that's where most visitors traveling on the cheap have gravitated to in search of a place to lay down their backpacks and rest their weary heads before heading out to the nearest bar selling cheap drinks and food in Soi Rambuttri. 'Soi' is defined as a lane, alley or small street. 'Thanon' means road and is typically meant for major roadways or avenues. Soi Rambuttri is a very unique U-shaped lane that straddles a massive white walled temple compound called Wat Chana Songkhram. 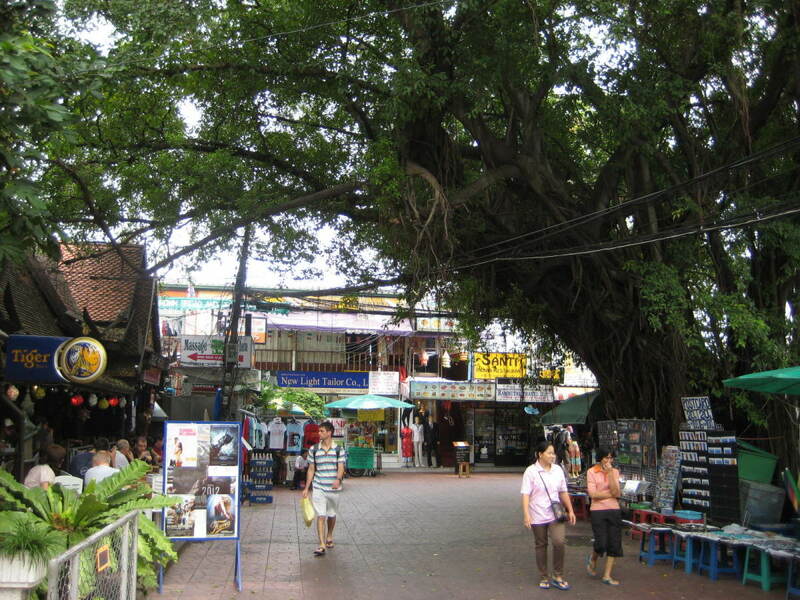 Walking around can be quite beautiful as large Banyan trees provide cooling shade cover. 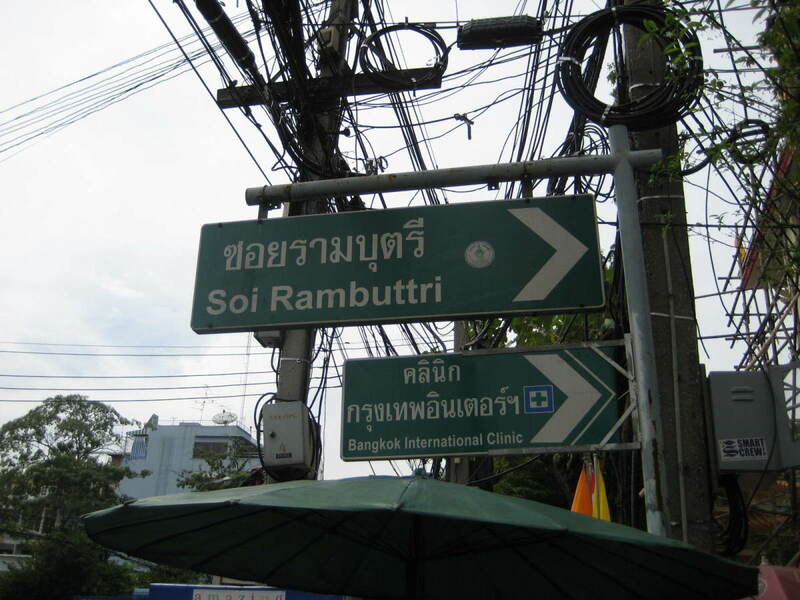 There are two entrances to Soi Rambuttri, well three actually but I'll get to that soon. 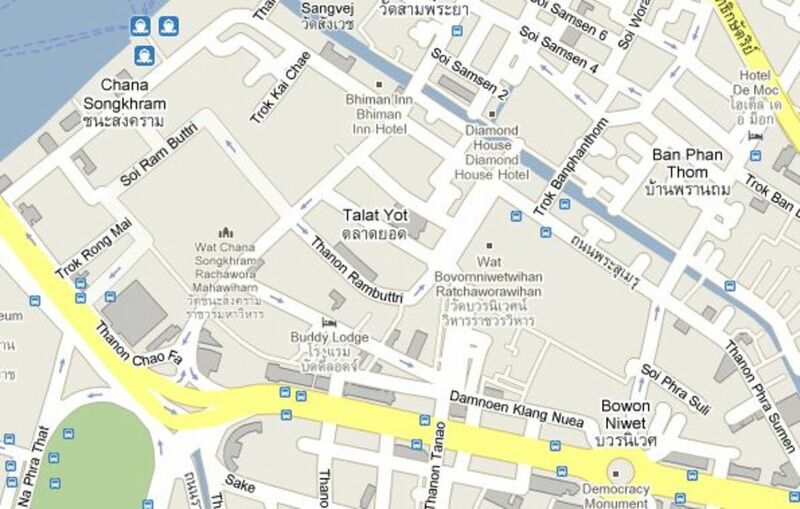 The main entrance, if you can call it that, is on Thanon Chakrabongse which is close to Khao San Raod. 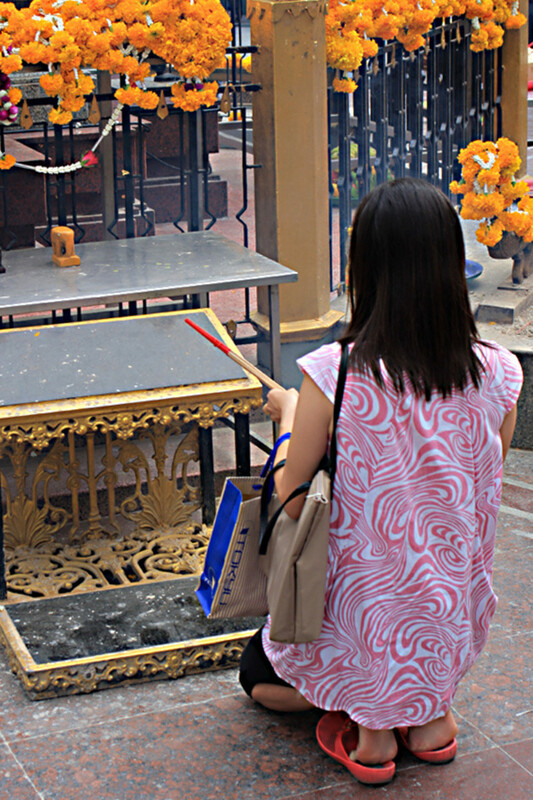 The second entrance is on Phra Ahtit Road which is easily found when you exit Phra Ahtit Pier. 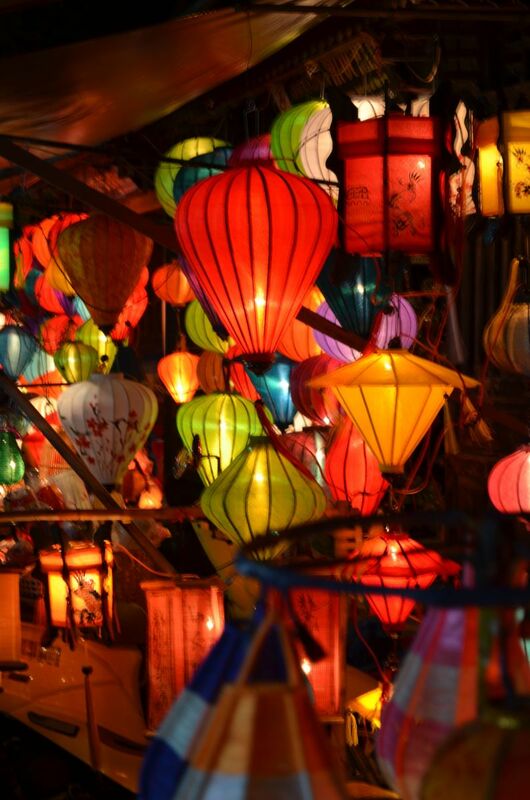 From there, just make a short walk south to Chana Songkhram road through a small lane filled with shops with services catering to budget travelers. The third entrance is found by walking through a small Japanese restaurant on Thanon Chakrabongse too, but it will lead you to a much quieter end of Soi Rambuttri. It truly is a peaceful place in a city that is commonly hectic. The pace is slower here in Soi Rambuttri, and you'll feel like you're sharing space and air with a bohemian community. 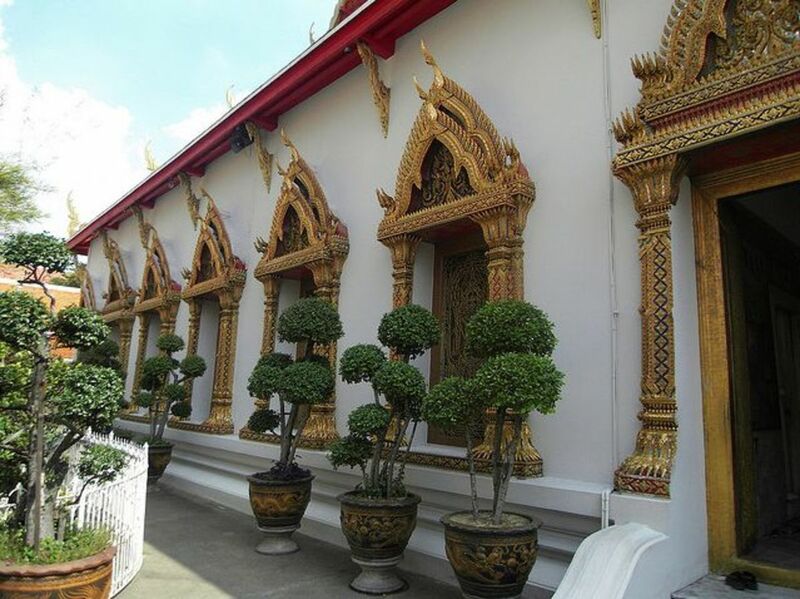 Banglumphu district, where Soi Rambuttri is located is not far from central Bangkok, it is just past the city's Chinatown neighborhood and right above the Majestic Grand Palace. 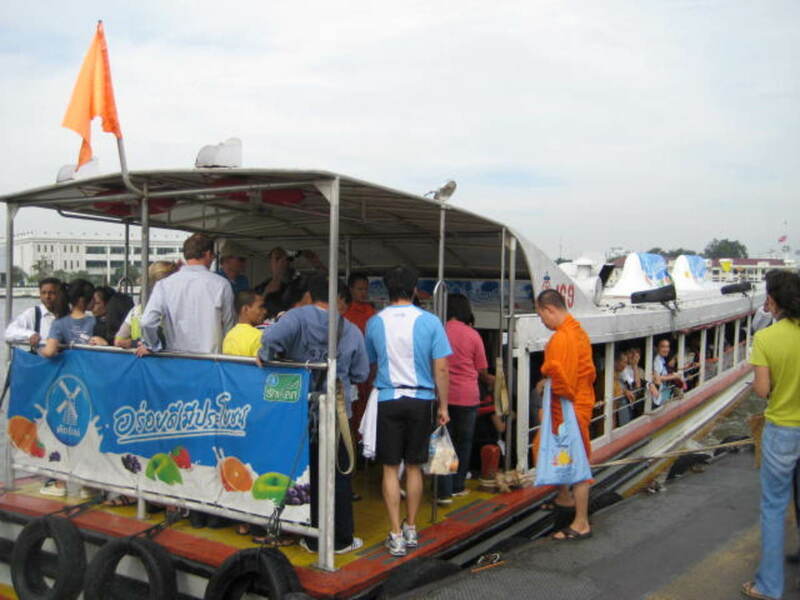 Express River Ferry Boat (recommended) - Soi Rambuttri is very near Chao Phraya River and if you take the ferry to Phra Ahtit Pier you will be able to walk to Soi Rambuttri in about 10 minutes. Metered Public Taxi - In most modern countries taxis are expensive. In Bangkok, they are really affordable. And since taxis can comfortably fit four passengers, sharing the cost is significantly lower. 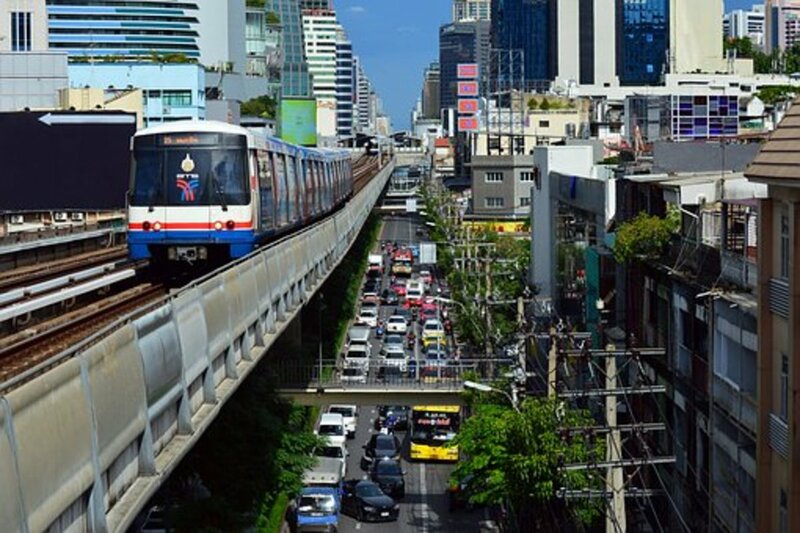 But one thing you should know is that the city's traffic, especially during the weekends, is really bad especially if you are coming from central Bangkok, say for instance from the Sukhumvit or Silom districts. Drivers know this too and they may refuse to give you a ride knowing that they won't make a lot of money stuck in traffic. If you are planning to make your stay near Soi Rambuttri during your entire visit to Bangkok then you won't be disappointed. Sure, there are many really cheap guesthouses and hotels in the area, but there are plenty more hotels that provide reasonably priced comforts. 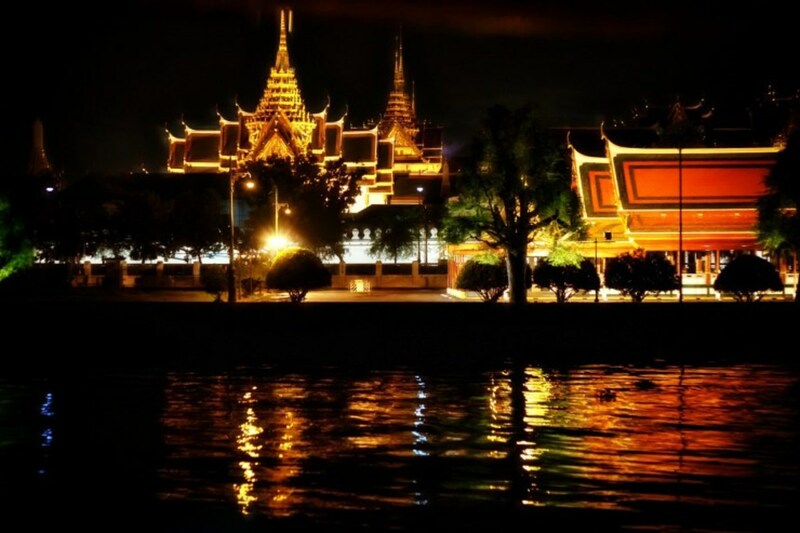 As of writing, now is actually the best time for booking hotels in Bangkok. Despite the high season which normally means higher room rates, many hotels have kept their rates down because tourism has seriously slowed down in the land of smiles. To further land yourself better deals and discounts it is best to reserve a room through an online hotel reservation agency based in Bangkok such as Agoda.com or take a look at CheapOstay.com to find the best hotel discounts in Soi Rambuttri and Khao San Road. It's beautiful on Soi Rambuttri, especially when December and January rolls along when the weather is cooler. 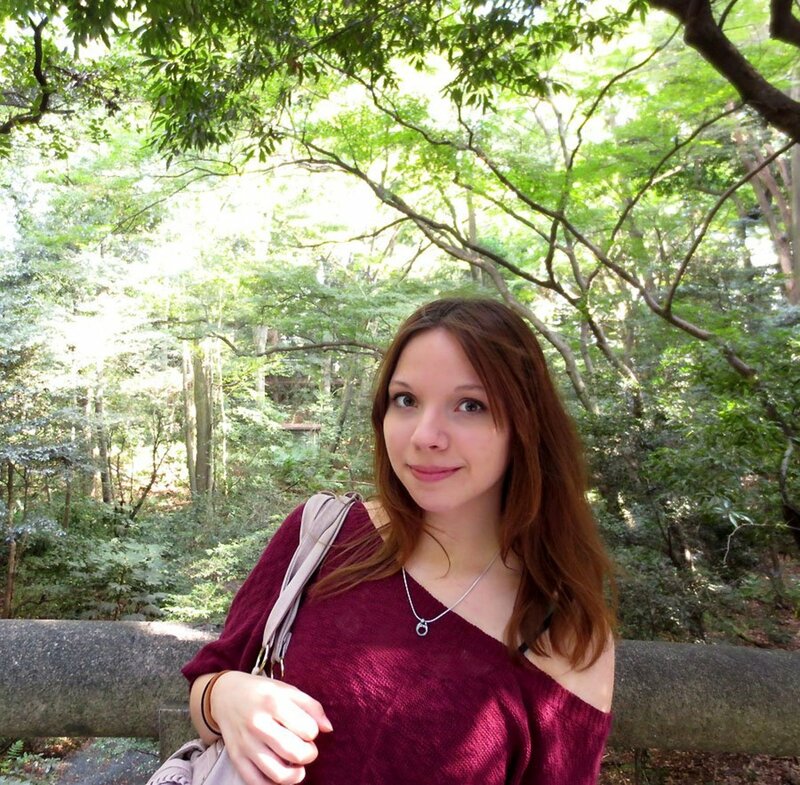 So just walking though under the cover of huge banyan trees is a treat! Shhh, don't tell everyone! I was just here tonight, love it.